ZDNet Editors identified 4 technology trends (automation, IOT, smartphones and VR) for 2017, of which we found two of interest. b. Over-complicated and unnecessary features--not to mention the occasional overheating battery. While PC makers have had to innovate as sales volume slowed, smartphone makers have instead failed to move away from the successful-but-aging format. This lack of innovation has mainly benefitted the second tier smartphone companies by giving them a chance to build phones that look like the flagships, have all the features that people actually use, and are a lot, lot cheaper. ZDNet seems to be late to the party as the overall difference in growth peaked in Q116 at (59.7%) and now seems to be closing (29.6% in Q117). 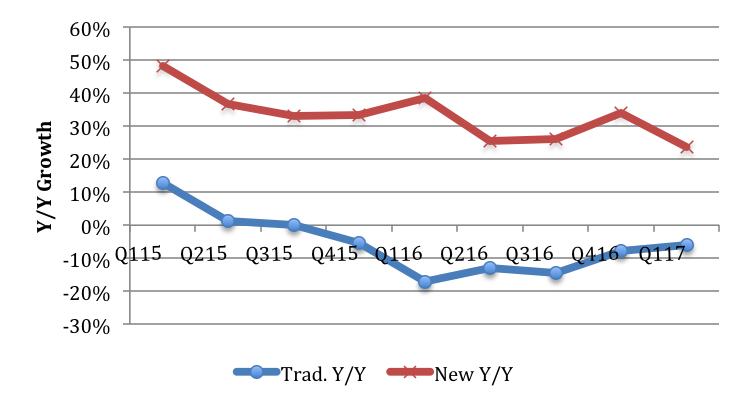 Moreover, with the rise in component and display prices rising, Chinese OEMs have been forced to raise ASPs, which has the effect of reducing sales disputing ZDNets conclusions. They predict that in 2017 those trends will accelerate, but current shipments belay that conclusion. Moreover, the Galaxy S8 and later on the iPhone 8 are likely to spur growth for the market leaders and could close the growth gap. ZDNet says that, “Much depends on the iPhone 8. After the so-so iPhone 7, it needs to come back with something more exciting, especially as it will also mark 10 years of iPhones.” Here they seem to also miss the boat as the iPhone 8 will only be available in the 4th quarter. 2. Virtual Reality Goes Real WorldZDNet claims that virtual reality is finding its way into healthcare, defense, and education sectors--and it doesn't always involve the overhyped headsets from Oculus, HTC, Sony and others. Google's Daydream View--the Nintendo Wii of VR--is being used to alleviate loneliness and isolation for long-stay hospital patients across Australia. For serious business users, the clear choice is the Microsoft Hololens and its ilk. But as we reported last week, Hololens is currently very expensive and Microsoft has elected to pass on an upgrade in 2017, so volume sales are unlikely. And of course, there are the consumer trio of Oculus, Vive, and PlayStation VR plugging away in the entertainment and gaming sector. It won't be an explosive uptake, but VR is will continue to pop-up in surprising non-obvious places, since businesses are showing far more interest than consumers in experimenting with the technology.